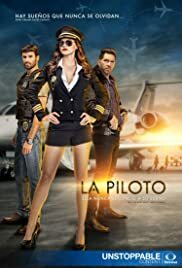 The story of a Mexican stewardess who, while very young, learned to pilot small planes and helicopters to carry out illegal travels carrying drugs and dollars. After many internal struggles in her life, Yolanda will seek redemption and true love with DEA agent Dave Mejia , will she succeed? Los hermanos Lucio se reúnen con los hombres del senador, él quiere expandir el mercado y ellos aceptan. Yolanda logra sacar del hospital a su tía Rosaura con la ayuda de John. In mid flight, Arley Jr. is kidnapped by Coronel Santamaría. Yolanda is desperate to find her son and asks for Dave's help to find him.